For some reason Sammy really wanted to learn about bats yesterday. He mentioned it during prayers the night before, so we fired up youtube and checked out some bat footage. 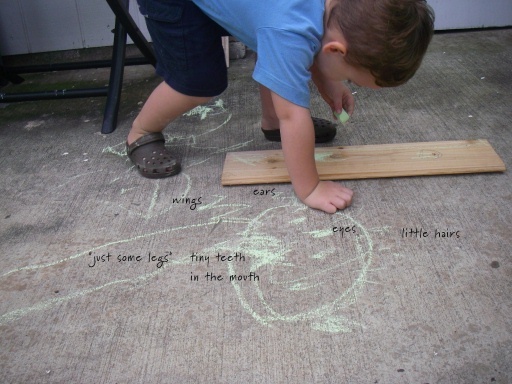 Then later in the day we were outside and I gave him a bunch of chalk to draw with. He came up with this completely on his own – see all the parts in the picture? I was pretty impressed by what he included with no coaching at all. It’s New Year’s Eve here – and it’s noisy!!!! The M-80s have been going off since noon and now they’re in full force. We drove around Kailua and it seems the Kihapai/Oneawa contingent is where the action is. The streets are filled with smoke, fireworks are filling the sky overhead, and driving a car is hazardous. So is breathing, for some people. It’s our anniversary so we’re going to sift through our treasure box of little scrapbook items we’ve collected during the year, seal it up as a time capsule, then hunker down like there’s a hurricane (i.e. in the middle of the house) and try to sleep! Oh my goodness! I can just hear him describing each part, and it also reminds me of Doug who had a similar drawing — maybe he was a little older and a little more detailed by then, but hearing those little voices explain every part is a treasure.